On 27 October the Night of the Night will be organized, an initiative to reduce light pollution. 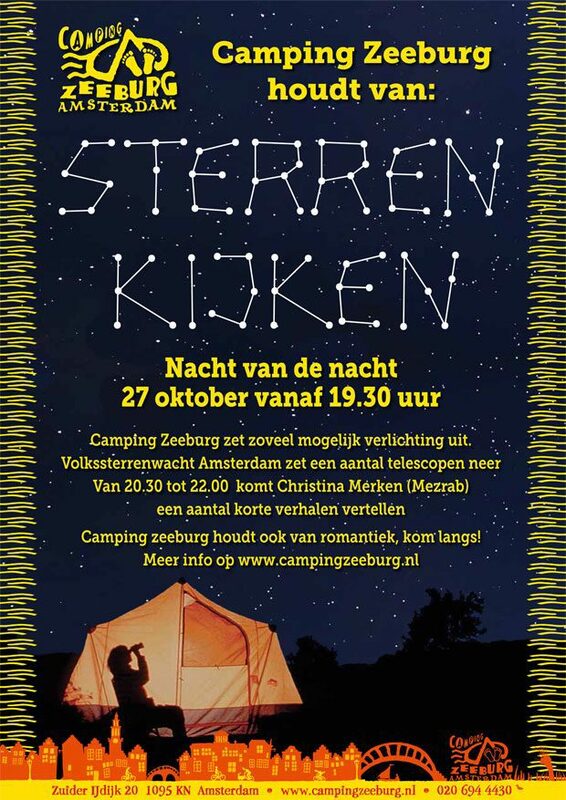 This year we are participating for the first time and we will turn off most of the lights on the campsite! Candles in the reception, dim light in the restaurant. The Volkssterrenwacht Amsterdam will pass by and in clear weather they will draw up some telescopes on our site. You are welcome to come to us with a number of objects to view the starry sky under expert explanation of the members of the observatory. To make the evening even more romantic, Storytrooper Christina Mercken will tell you some short stories about the fireplace in our restaurant. Christina is a well-known storyteller from the Amsterdam scene. She hosts her own story nights at Mezrab Amsterdam and Mezrab in the House Groningen. Whether she dresses old folk tales in a new coat or shares personal true stories, it is always a pleasure to be transported through her stories.